Beveled glass pyramids house local shells, flora, fauna and sand. They make a very popular souvenir. 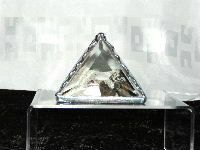 Available in 3" and 4" pyramids or cubes. 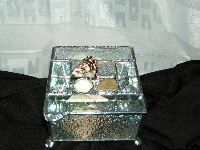 Beautiful 6" x 8" beveled glass box with mirrored bottom. 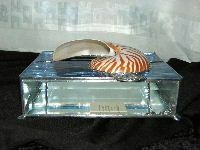 Available in either blue or peach waterglass with a exquisite nautilus shell set in the hinged lid . More reflections of the coast are demonstrated in the lid of this 4" x 4" box with a mirrored bottom and hinged lid. Each lid is different with various beach stones, glass, shells, etc. Beautiful 14" winged platter, kiln fused with bamboo pattern. 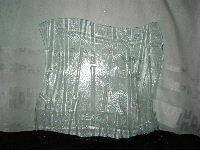 Also available in a basket weave glass pattern. 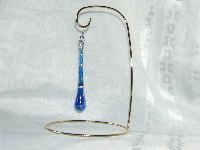 Hand-soldered "Island Raindrops" have been the main focus of Destiny Glass for 14 years, each comes with a "Raindrop" poem. They are available in cobalt, aqua, amythist and peach. 4.5" and 8". Great souvenir!